Recently my husband and I went to lunch with Shelley Brantley at the new Italian restaurant, Harborside Italian & Seafood Restaurant, located in the old Fogel Mall. We have known Shelley Brantley for more than twenty years. Our daughters were close friends for a long time. They grew up and eventually their lives took them in different directions, but Shelley, his wife, Brenda, and their two sons are still here in Georgetown. In spite of our children’s lives crossing paths, Shelley and I met long before then. I asked if he remembered that encounter. “I can’t say that I do,” he confessed. Shelley and Brenda moved here to Georgetown in June of 1989. Together, they’ve raised three great kids and made a strong home for them and their own children’s children. Shelley is forever the public figure. I think that every time someone called for a police officer he was the one who showed up. “Did you always know you wanted to be a cop?” I asked. “Oh yes. I have wanted to be a police officer since I was like five years old,” he answered with conviction. “I come from a family of lawmen so it was kind of in my blood be in law enforcement. “You knew she was dating your friend?” I laughed at his audacity. I couldn’t believe he was a girlfriend stealer, too. I know his wife so I’m guessing that as afraid as he was of facing Brenda for leaving like that, Shelley was more afraid of those snakes. “And you lived to tell the tale,” I offered without any sympathy whatsoever. We talked a lot about family and how they play different roles in our lives. Shelley spoke of his brother who lives in Thailand (by choice, not by means of war) and his other brother whom he described as his “disorderly conduct brother.” Shelley said the other two didn’t show any desire to be a cop as he did. When moving to Georgetown, Shelley didn’t waste any time applying for a position with our own city police department. With his background in law enforcement, Shelley said it was a piece of cake to get hired on and he’s been there ever since. Shelley has made it up the rank from corporal, to sergeant, to lieutenant. He’s retired once already but being a police officer is so deep in his roots, that he’s come out of retirement and is now a patrol officer. He’s happy doing what he does. I didn’t ask for too much information about arrests around Georgetown because I didn’t want him to feel as though he was put on the spot. However, Shelley did share with me a humorous story about an arrest. “So you arrested him?” I asked prompting him to continue. For what it’s worth, I’m glad they found their way here from Jasper County and made Georgetown their permanent home. 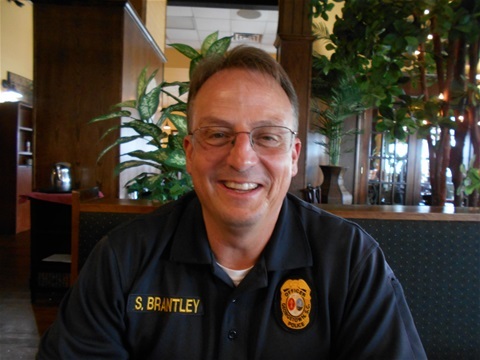 This town, and the police station, would not be the same without Shelley Brantly.